Hands up if you love a good cuppa. Yep, me too - nothing beats it, especially after a really long, hard slog of a work day. I'm actually more known for being a bit of a coffee fiend if I'm honest - I used to have quite a lot of the stuff at one point - however, since I became pregnant, I wouldn't exactly say I've "gone off" of the taste of it but I would now much rather have a steaming hot mug of tea instead. So it was fairly obvious then that when I was asked if I would like to have a little try of a fancy tea making contraption along with some pritty fab varieties of loose tea that I said yes. I must admit, loose tea is kind of a new concept to me - at home I'm more a Yorkshire-Tea-from-a-bag kind of a gal, I mean I do have a little loose-tea-appropriate-tea-pot but it very rarely comes out of the cupboard. But when I'm at work I do struggle a little bit - I'm always on the go and I find it really difficult to ever actually sit down and spend a few minutes savouring a good, hot cuppa. 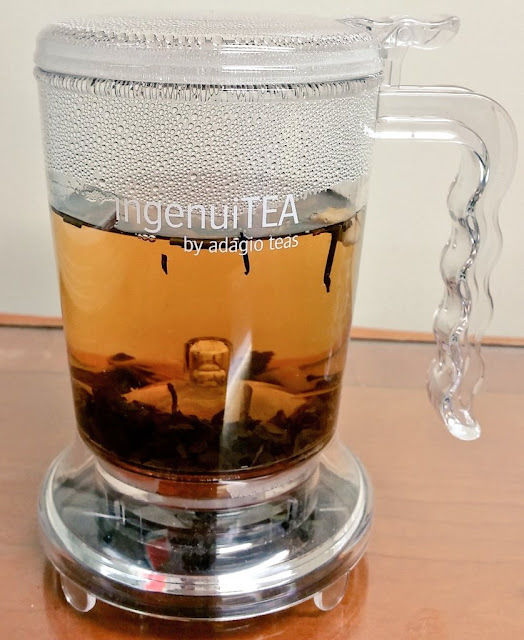 Well, simply take the IngenuiTea maker to work with me of course! And it really has been working for me - quite successfully too I may add. After a few minutes all of the flavoursome loose tea has steeped and infused into the water and it is ready. And then comes the clever part. Simply pop a mug underneath the teapot, sitting it directly onto the rim of the mug and watch whilst tea is served. As the teapot hits the mug, a valve is released which allows the tea to flow through and down into the mug whilst all of the loose tea - every single bit of it - remains in the teapot above. It's brilliant - but what is a fancy, squeal-creating teapot without any fabulous loose tea to enjoy with it? So it's very handy then that I was also sent a selection of fantastic teas to sample alongside the fab IngenuiTEA pot. I'm not a huge fan (not at all) of green teas so I avoided these like the plague and instead was sent a few of Adagio's slightly "darker options" to tantalise my taste buds and I've really found myself enjoying them. Today for example, I had a few mugs of the fairly sweet Peach Oolong tea and the smell as it steeped in the hot water was just amazing - my office smelt all fruity for ages - even after the tea was gone.